The summer of 1993 and outgoing Radio 1 controller Johnny Beerling is trying to keep his in-tray clear ahead of his departure that coming autumn. Beerling is a BBC-man to the core, starting with the Corporation in the late 50s as a TO and later studio manager. 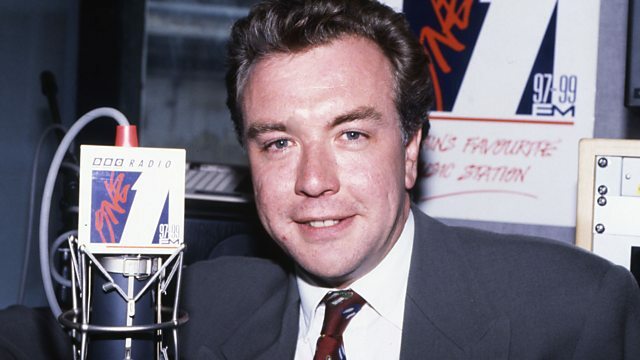 He'd produced music shows for the Light Programme and Radio 1 - there on day one producing Tony Blackburn's opening show - moving up the executive ladder to become the station boss in 1985. In June 1993 it was announced that Johnny would be stepping down later that giving the incoming controller time to set his or her own schedule for the autumn. The following month it was announced that Matthew Bannister had bagged the top job. Bannister brought experience from both the BBC and commercial sector with time at Radio Nottingham, Radio 1's Newsbeat, Capital Radio and the transformation of Radio London into GLR. Director-General John Birt had then hired Matthew to co-ordinate the internal task forces that were considering the charter renewal and it was probably that involvement the triggered alarm bells amongst some of the time-served veteran DJs. 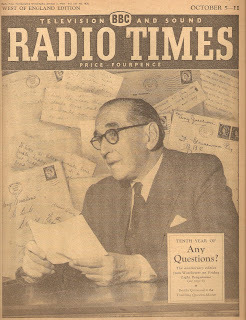 As a sign of things to come during his interview for the Radio 1 controllership BBC chairman Marmaduke Hussey had asked Bannister: "How do you feel about being Mr Nasty in the national newspapers". 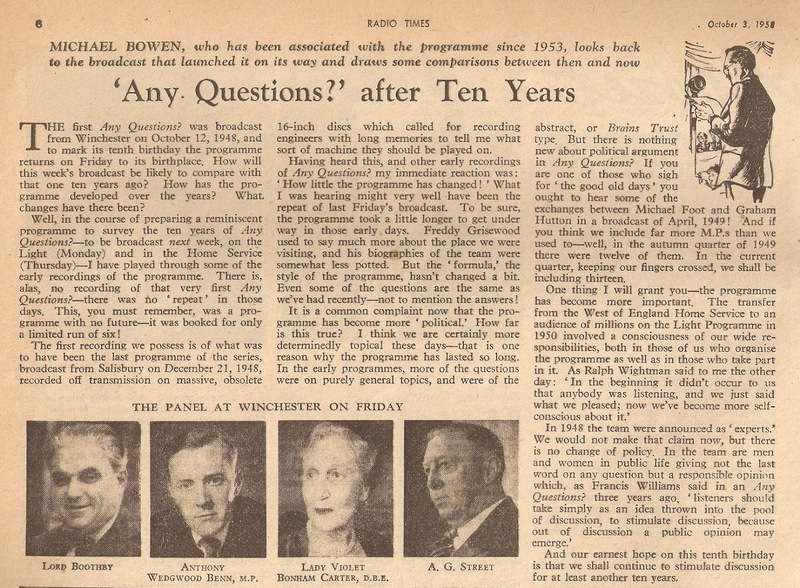 Under John Birt's stewardship the BBC was wrestling with that charter renewal, the introduction of internal markets and for radio, increased competition from commercial radio. There was talk, in the corporate blueprint Extending Choice, of Radio 1 being "more informed and intelligent" and that any speech content should be "more demanding" whilst at the same time ensuring that it stayed relevant to a younger audience. The issue was that people who'd been listening to Radio 1 since the late 60s and early 70s were still listening, myself included, and some of the DJs were voices from that period too. 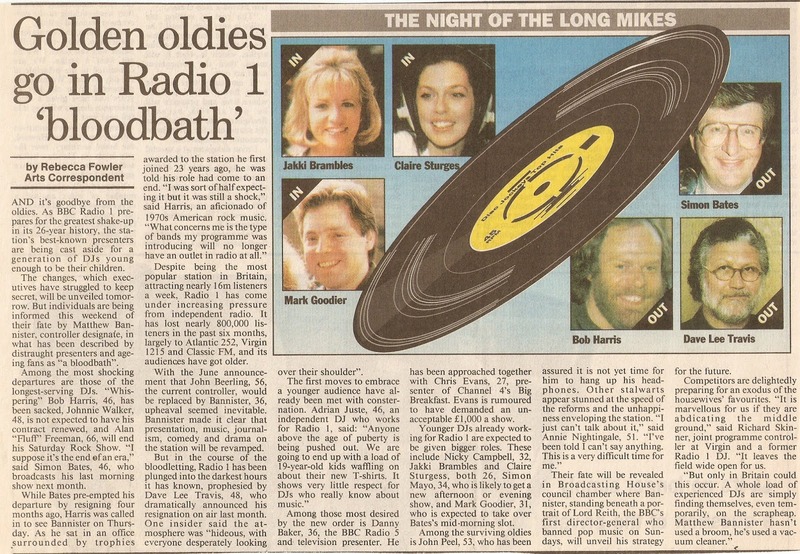 The problem for Radio 1 and the listeners that had grown up with the station was summed up in a July 1993 article by Giles Smith of The Independent: "Honouring them while keeping the kiddies happy, Radio 1 is forced to chase from side to side, and you can hardly blame if for occasionally looking slightly giddy". In the same article Simon Mayo addressed the dilemma of Radio 1 distinctiveness: "We have to able to argue that a presenter, a friendly voice behind the microphone like Johnny Walker (sic) playing two hours of music, with minimum intrusion, satisfies the criteria of difference and distinctiveness, because of the variety of music being played. Now some of the BBC governors perhaps do not recognise that there are different types of pop music. To some of them it all sounds thump thump thump. But that is the message Bannister has to get across". Matthew Bannister talked about wanting Radio 1 to be "more appropriate for a generation of younger people" but, as he recalls, "we never discussed any names". Speaking to The Guardian he expounded on his plans: "The only way I will judge who presents shows is on ability, not on age. I do not intend to define audience by age , nor do I intend to define presenters by age. Everyone pays the licence fee - and I am not going to say this is not a radio station for you. It is for anybody open to ideas, popular music and entertainment." Nonetheless, the reaction was swift and by August Dave Lee Travis made his now famous "changes are being made here" speech and set off a domino effect as one by one DJs left the station. It was Johnny Beerling that had to deal with DLT's departure (Bannister was on holiday in Minorca) and dismiss the Hairy Cornflake after he had given an interview to The Sun, despite a request not to speak to the press. Radio 1's new Autumn schedule was announced in September. To clear the decks some big name departures were mentioned. Simon Bates had already tendered his resignation knowing that he wouldn't be offered a new contract. "Frankly, I'd been there two or three years too long" he said later. "I was old even then, and could hardly be considered a hip, groovy thing, so there was a great deal of work to be done to make up for that." Bob Harris remembers being let go when Bannister told him that they were repositioning the network. "What from 16 hours to nothing?. Although I was expecting drastic news, this still came as a jolt." 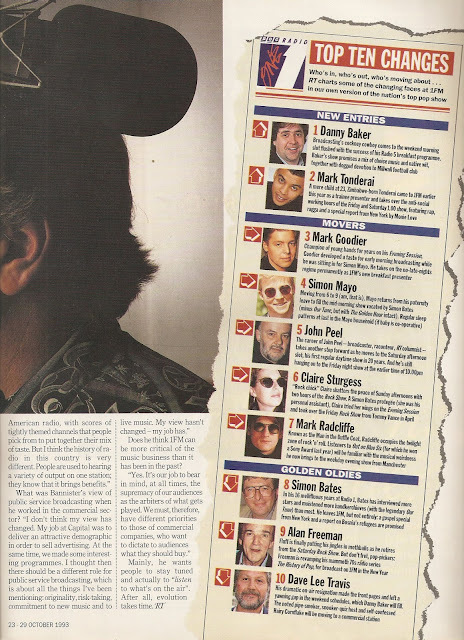 The other big name casualties were Alan Freeman who been asked back to Radio 1 by Johnny Beerling in 1989, though he didn't disappear from Radio 1 completely as he was heard in 1994 in the 52-part revamp of The Story of Pop. Also on the way out were Gary Davies, who by now was just on at the weekend and Adrian Juste who's one hour Saturday lunchtime shows melding comedy and music were works of art. A not unnaturally annoyed Adrian was quoted as saying "Anybody above the age of puberty is being pushed out." Others dropped were The Man Ezeke and Paul Gambaccini who was doing the odd special for the station. Both Johnny Beerling and Matthew Bannister had floated the idea of moving some of the outgoing Radio 1 DJs over to Radio 2, an idea that was rejected by Frances Line, after all what would happen to the existing Radio 2 stalwarts? Mind you in time some did eventually make it over the Radio 2 with Fluff and Whispering Bob enjoying regular shows on the network from 1997 and even Gary Davies taking up residence, though that was some 20-odd years later. Aside from that is was a case of shuffling the deck. John Peel got a Saturday afternoon slot, Simon Mayo got the weekday mid-morning show, Mark Goodier looked after the breakfast show, albeit temporarily. In came Danny Baker, Mark Tonderai and, replacing Jakki Brambles in January 1994, Emma Freud. 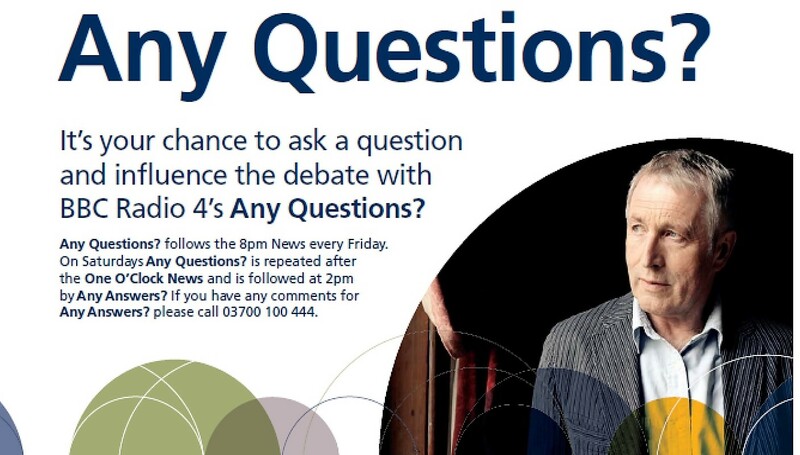 There was a new late-night show for Mark Radcliffe. As for the rest of the DJ team most stayed put or were subject to minor changes in time slots. That team consisted of Steve Wright, Bruno Brookes, Pete Tong, Jo Whiley, Steve Lamacq, Lynn Parsons, Andy Kershaw, Annie Nightingale, Claire Sturgess, Steve Edwards, and Neale James and Johnnie Walker. Radio listeners are creatures of habit. As the controllers of the BBC's other national networks knew to their cost, any tinkering with the schedule didn't tend to go down well. Bannister's one regret was that too many changes were foist upon the listener in a short space of time. "Sometimes when you're up against the wire you can cause some distress, and I'm sorry if that's happened", he told the Sunday Times a year later. "And I see that the speed of the changes is something that our audience has been concerned about. But since change was overdue and certain people were leaving anyway, I thought it was better to get on with it and send out a clear signal that Radio 1 was on the move." Now, of course the age of those on-air itself is largely irrelevant if they continue to be enthusiastic about the music they play and their style appeals to the audience. The problem for Radio 1 was the dramatic change of gear and the purge of some much-loved names hit the audience figures. 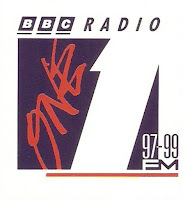 In June 1993 the station had 19.23 million listeners. By January 1994 they had haemorrhaged just over 4 million of them, down to 14.84. By the end of 1994 just 11 million adult listeners (15 plus) tuned in although as Matthew Bannister later admitted "the biggest turn-off was the departure of Dave Lee Travis" an event that predated his arrival. The figures never again reached their summer 1993 height and bubbled around 11 or 12 million for the next 20 years or so (the latest RAJARs show 9.6 million), though they did receive a fillip when Chris Evans was signed up in 1995 to host the breakfast show. 1993 did indeed mark the watershed for Radio 1 and, after 25 years on air, many long-time listeners seemed to switch off and go elsewhere. And that's certainly the admittedly skewed consensus you glean from reading messages on some Facebook groups where folk often lament that Radio 1 was never the same after that. But perhaps these are the very listeners that the station needed to shed. 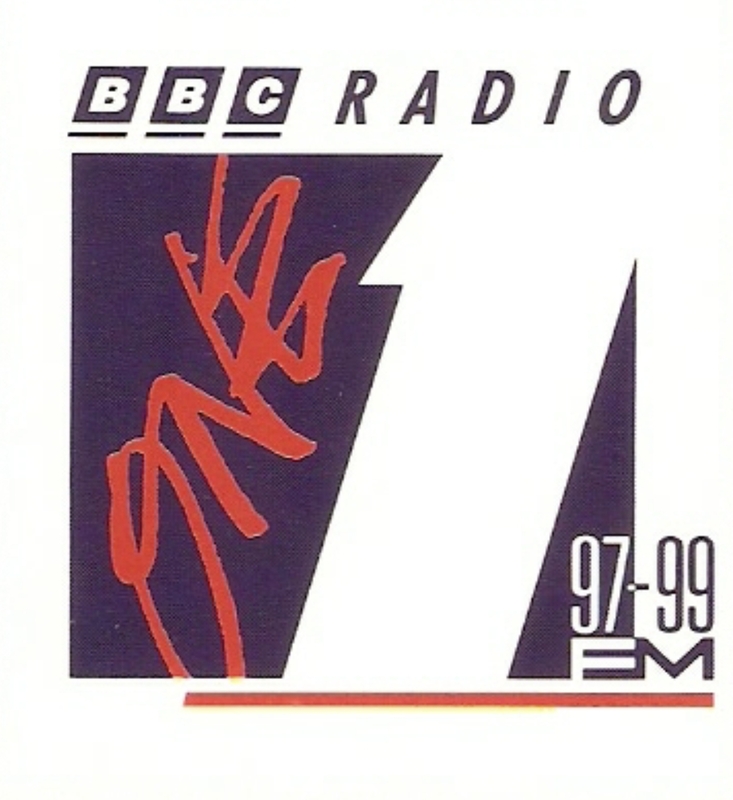 In fact there was still much to enjoy on Radio 1 and in the mid-90s the station benefitted musically from Britpop and a thriving dance music scene, more comedy including Chris Morris, an increased number of independent productions, shows from Mark and Lard, Kevin Greening and the first year of Chris Evans's brekkie shows. There was even a glossy new marketing campaign in 1995 called As It Is to highlight what was on offer. Time to listen to what was going on in October 1993. This collection of archive audio comes from my own tapes. Late night changes were scheduled with Nicky Campbell's Into the Night show ending after five years. Nicky took a couple of months off to look after his sick wife and returned to the station in January 1994 on the drivetime show. Into the Night would feature an eclectic mix of music and guests from the world of music, film, literature, comedy and politics. A regular guest was Frankie Howerd, hence his brief appearance at the start of this show which gets off to a false start. This is part of the final show broadcast from 10 pm to midnight on Thursday 21 October 1993. Bob Harris had rejoined Radio 1 in 1989 and took over the post-midnight show the following year. Bob would champion many new bands and singer-songwriters, often in live sessions, that most other shows and stations overlooked,all mixed with a dash of rock 'n' roll. Although forced off Radio 1 he would return in 1997 on Radio 2 with a Saturday late night show. This is just half of Bob's Radio 1 swansong that was broadcast from midnight to 4 am on Friday 22 October 1993. Bob's final record choice may surprise you. The biggest departure was Simon Bates who'd ruled the mid-morning slot since 1977 with The Golden Hour (inherited from Tony Blackburn) and Our Tune becoming features that listeners would specifically tune in for. (In the words of John Peel: "At eleven in the morning every layby on every major road in the country was full of weeping truckdrivers.") For his final show the BBC splashed out on an OB from the Carnegie Deli on New York's Seventh Avenue. "I wanted a weekend in New York it's an excuse to be with people I like." 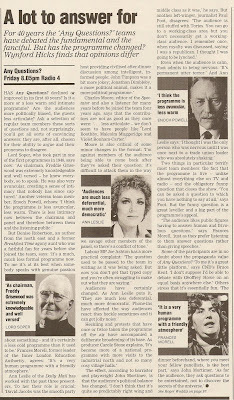 This is most of that final show as broadcast on Friday 22 October 1993. Note the Tommy Vance into at the start presumably resurrected from his 1987 Bates in the States week. "I've suddenly realised he works for another radio station as well"
Johnnie Walker survived the initial clear out of the old guard, for a while at least. Johnnie had worked for Matthew Bannister at GLR until he was sacked for breaching BBC protocol and putting live phone calls on air. He'd returned to Radio 1 in 1991 with an independently produced Saturday afternoon show, not dissimilar to The Stereo Sequence that he'd presented in 1987 and 1988. His show continued under the new schedule but shifted to a 7 pm start. However, it too came to end, with just two weeks notice for Johnnie's Wizard Radio production company that he'd set up with Phil Ward-Large, in October 1995. This is Johnnie's show from Saturday 23 October 1993. Of all the Radio 1 DJs it was the legendary Alan Freeman that had been with the Beeb the longest, starting on the Light Programme in 1960. He'd left in 1978 to work for Capital Radio but was enticed back in 1989 to present Pick of the Pops as a retro chart show and to resurrect the much-loved rock show. Fluff's final Saturday rock show was broadcast on 23 October, this is how it sounded. Ezekiel Gray, aka Man Ezeke, had been broadcasting his Sunshine Show on BBC Radio Bedfordshire when he joined Radio 1 in 1990. That show ended in December 1992 and the following month he was given the Sunday lunchtime replacement for Pick of the Pops - Alan Freeman having stepped down from that show - another retro charts show called Number Ones on 1FM. He seemed ill-suited to that format and his contract was not extended beyond October 1993. This is an hour of his last show from Sunday 24 October. In March 1992 Gary Davies left the weekday lunchtime show - Jakki Brambles took over - for weekend breakfast and a Sunday late-night show. His contract was not renewed beyond Beerling's tenure and he left to join Virgin 1215 and later set up his music publishing company Good Groove. 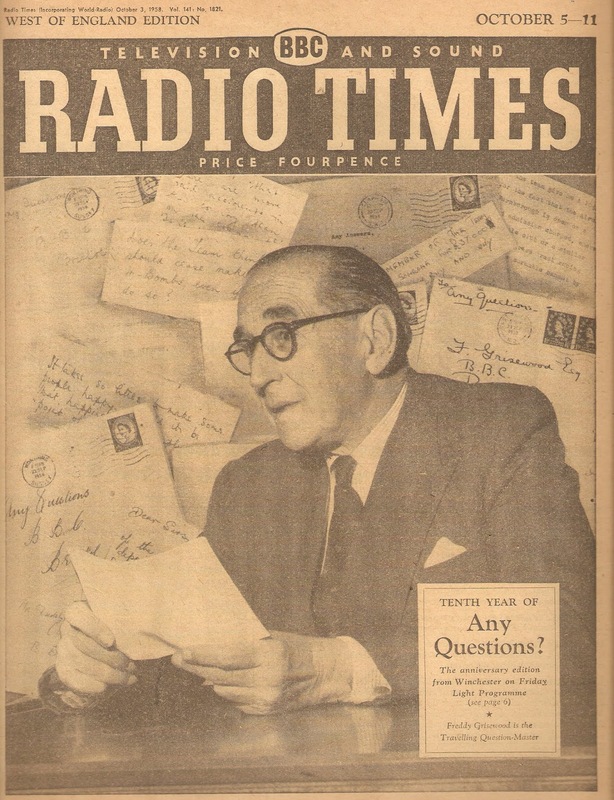 Davies supposedly told Bannister that "mine is the most popular night-time show you have on radio" to be told that he preferred "shows that lead". Davies had "no idea what that means." This is the last half hour of Gary's Sunday night/Monday morning show from the early hours of 25 October. Like Nicky Campbell and Alan Freeman he plays out with The End from Abbey Road. 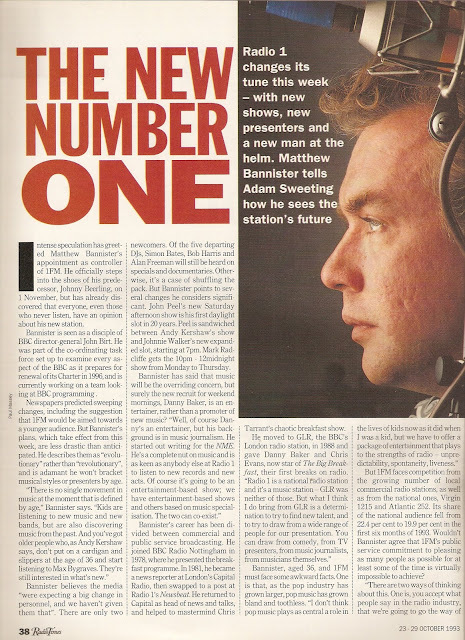 Matthew Bannister took over as Radio 1 controller from 1 November but the re-vamped schedule kicked in from 25 October. On the breakfast show was Mark Goodier, billed as his "first official day in charge". Mark had been standing in for Simon Mayo for a couple of months whilst he'd taken some paternity leave. Matthew's plan had been to move Steve Wright into the breakfast show but he couldn't persuade him to start until the following January giving Mark the shortest stint as a Radio 1 breakfast show presenter. Here's 48 minutes of Mark from 7 am on Monday 25th. The newsreader is Peter Bowes and Steve Mann provides the sports news. Taking over from Bates was Simon Mayo, a timeslot he would occupy until early 2001. "It's still The Golden Hour. It's still Simes. It's just a different Simes that's all". This is the early part of Simon's first show. Missing from this recording is the return of Confessions, a guest appearance from Phil Collins, a new feature called God of the Day but we do get to hear Simon answering the calls to his private line 071 636 1111. With Mark Goodier covering for Simon Mayo earlier in 1993, the Evening Session was handed to Jo Whiley and Steve Lamacq. They became the permanent presenters of a "remixed and extended" Evening Session from Monday 25 October. This is the first 30 minutes. Mark Radcliffe had been working for Radio 1 as a producer since 1983 but had been in front of the microphone since 1991 with the weekly Out on Blue Six and on Radio 5 with Hit the North from 1990. From 25 October Mark finally got a four nights a week late show live from Manchester, that would be nicknamed The Graveyard Shift. "Greetings space cadets and welcome to the new bright young sound of night-time 1FM presented by a bloke who's older than the last one." With Mark was his co-host Marc 'The Boy Lard' Riley. Regular contributors would be Simon Armitage, Harry Hill, Mark Kermode, Mark Lamarr, (just to add to the Mark quota) and John Hegley. On this recording of the first 30 minutes The Tindersticks are in session. Lynn Parsons joined Radio 1 in late 1991 from Capital Radio. For the next four years she mainly presented overnight shows as well as providing holiday cover. This is the first half-hour of Lynn's show from just after midnight on Tuesday 26 October 1993. 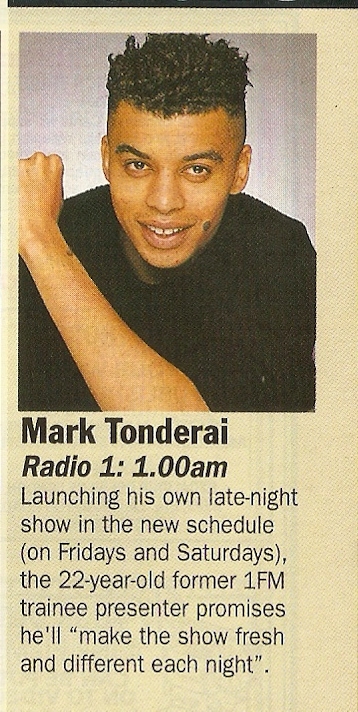 The newest name in the line-up was Mark Tonderai, the station's trainee presenter (did anyone else ever have this role?) with a late night show billed as The Jam. He told The Daily Telegraph "I'm from Harare and have lived here since 1989 working as everything from a fishmonger to a cycle courier as well as doing a degree in architecture at Kingston University. I started as a trainee presenter and only heard last Thursday that they had given me this job." Mark stayed with Radio 1 until February 1996 before moving into radio production elsewhere in the BBC and later as a TV and film writer and director. Viewers of the current series of Doctor Who will have spotted his name in the credits of a couple of episodes. This recording is of the first 30 minutes of Mark's first show at 1 am on Saturday 30 October. By the way I make that opening announcement six words and not five. 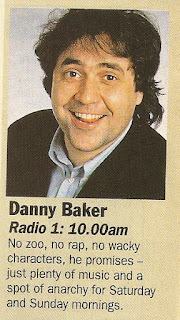 Bannister's big name signing was Danny Baker, an mate from his days at GLR. who'd recently been on Radio 5 looking after Morning Edition. The new Radio 1 show carried on in much the same way interspersing the often obscure musical choices with intelligent chat, live 'stunts' over the phone from listeners and discussions about the minutiae of popular culture. 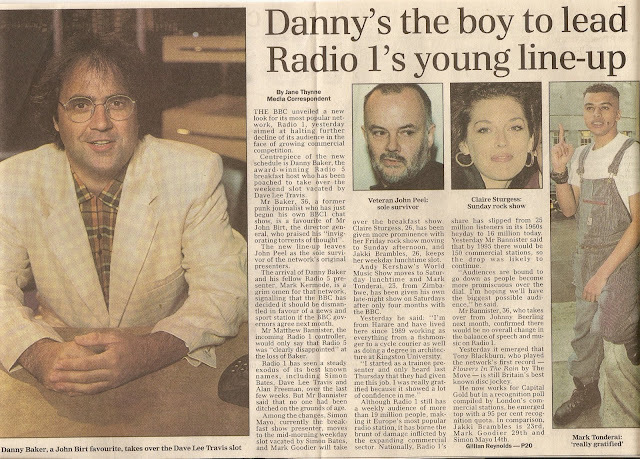 Danny was with Radio 1 for 3 years. He was, he wrote in his autobiography, "never a really good fit and came to a two-pronged tipping point when the new boss of the station, a beleaguered Matthew Bannister once more, was attempting to haul the network out of its ageing complacency at the precise moment the British public began to feel that I was popping up a bit too much in their lives..."
This is the first 40-odd minutes or so of Danny's first show on Saturday 30 October. With him is Allis Moss and Danny Kelly. Note the reference to Chris Evans "but my goons intimidated his supporters in the north". Andy Kershaw had been heard regularly on Radio 1 since 1985 most often in evening time slots playing world music or covering for John Peel. So it was perhaps surprising when he was moved to a Saturday afternoon show, though it was relatively short-lived, by November 1994 he was back on the night shift. Kershaw remains pretty scathing about the changes during this period. "It was the arrival of these Birtists, following the loss of our protector, Walters, to retirement in 1991, that we can pinpoint the marginalisation of Peel and Kershaw on Radio 1, in my case eventually into exile as a refugee on Radio 3, and in John's, devalued into a dead of night slot, and having much of his enthusiasm purged in the process". This is the first 45 minutes of Andy's show at 2 pm on Saturday 30 October. One of the other major schedule changes was a Saturday afternoon show for John Peel, the first time he'd had a regular daytime show since the days of Top Gear coming to an end in the mid-70s. Initially Peel was supportive of the changes at the station. "The new 1FM... has contrived to sound different without sounding as though it is being different for the sake of being different, if you see what I mean." 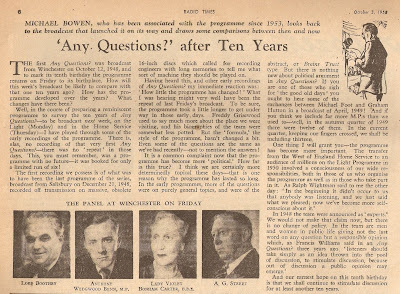 But a couple of years later when his broadcasting hours were chipped away at he expressed concern that "there does seem to be a new orthodoxy in the air which supports narrowly-focussed programmes rather than broadly based ones built on the if-you-don't-like-this-record-wait-until-you-hear-the-next-one principle." With a Friday night show now being followed by a Saturday afternoon one John Peel rather than drive back to Suffolk he takes to staying in overnight at a small hotel in Paddington. As the BBC baulk at paying his £80 hotel expenses he's forced to pay it out of his own pocket. 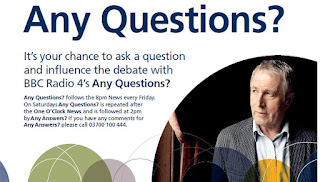 This is the first part of John's show from 4.30 pm on Saturday 30 October. "As you may have noticed nearly everyone of the new everyday value 1FM is called Mark. So welcome to the Mark Peel programme." (A longer recording of this show exists - see the John Peel wiki site). On Sunday afternoons Rockline with Neale James is moved to an earlier and this was followed at 4 pm by the Rockshow with Claire Sturgess. The rock show dates back to 1978 following Tommy Vance's return to the station. He then left Radio 1 in April 1993 to join Virgin 1215 and all of a sudden The Sturge had a regular show, after having worked as a production assistant on Simon Bates's show and getting her first stab at presenting when covering the Evening Session in March. This is the first 30 minutes of Claire's show on 31 October 1993. Steve Edwards had joined Radio 1 in January 1993 to present a show of soul and new jack swing. Initially for an hour each Wednesday, under the new schedule Steve was shifted to Sunday night and given an extra hour. Steve left the station in early 1996 and would later broadcast for a US jazz station. Other than that I know nothing about Steve's career either before joining the BBC or after it, so if you know m ore please contact me. This is how The Steve Edwards Soul Show started on 31 October 1993. 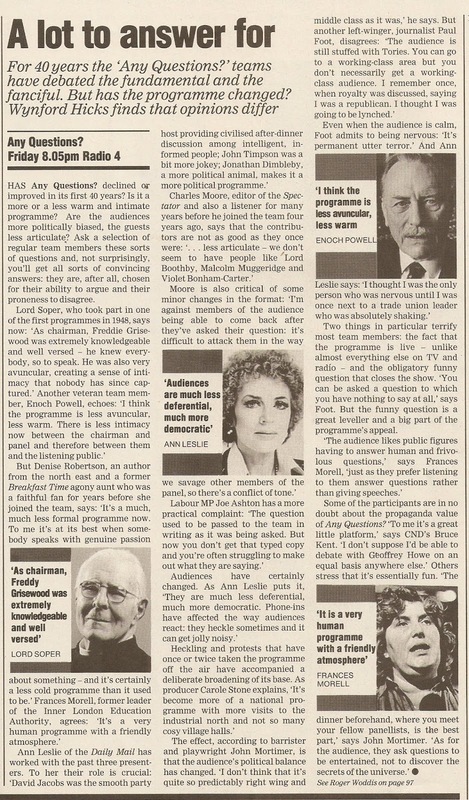 One veteran broadcaster that survived the cull was Anne Nightingale. 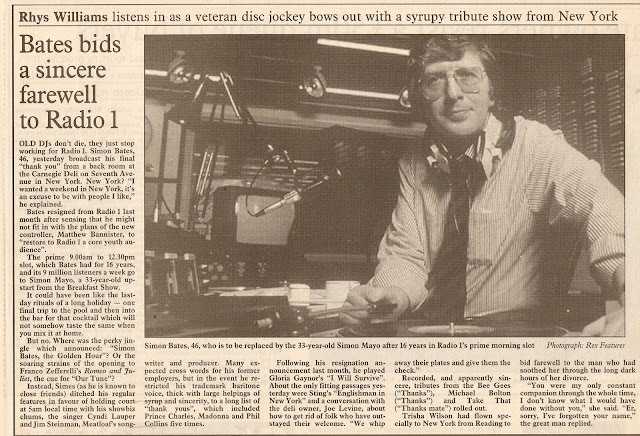 Her request show, a radio institution, had been running on Sunday evenings since 1982 (an earlier Sunday afternoon request show ran from 1975 to 1979). From 31 October the show's start time shifted from 8 pm to 10 pm and was a Halloween special. This is the first 30 minutes.